Today we’re focusing on Part III of Michael Hyatt’s “social media networking and marketing bible” (or at least that’s what I call it! ): Platform. I’d you’d like to get caught up to speed, you can also read Part I and Part II. No matter what your Platform is, Michael Hyatt’s wisdom will help YOU create and maintain it. In this post, we’ll be focusing on the gems of wisdom that stood out to me most in Part III: “Build Your Home Base.” We already made sure to “Start with Wow” in Part I and prepared to launch in Part II. I found this section of the book to be particularly packed with information I needed to know or relearn starting with the types of marketing I engage in. For someone who doesn’t have the funds they would like to have, this chapter is important. I’ll even go as far to say that if you have the funds you’d like, it still won’t make the best impact and give you your money’s worth if you’re not spending on the right things and putting it in the right place(s). Internet marketing is the next best thing to word-of-mouth marketing as it concerns reach and cost. It costs you nothing to tweet. It also costs you nothing (or a little bit) to maintain a professional page on Facebook. Pinterest, personal blogs, etc. the list goes on. These are all free outlets to use as “borrowed platforms” for your brand and products. You can also start implementing cost-efficient advertising with the likes of Google Adwords, Facebook, and other similar options. Unless I ask someone to guest on my blog, I will never have someone pushing out content for me as a rule. The only exception to this would be if I hired an intern or other team member for one of my growing enterprises—yet they would still represent themselves on behalf of the my company—not as a ghost-blogger, tweeter, etc. Michael Hyatt’s very keen on this point: if you’re not going to maintain your blog (or Twitter account) yourself, then don’t bother at all. People will interpret a ghost-blogger, etc. inauthentic and it will ultimately hurt your brand. This is something I have to work on myself. My About Pages read just like a bio that you would have in the back of your book, submitted alongside and press release, almost like a resume in prose. Ouch. Michael elaborates on the fact that an About Page should be written in first person (yes, this is against EVERYTHING your English teachers and professors taught you!). It should also be written in a conversational tone which is much harder to do in second or third person. Your About Page should be about what the reader wants to know as well as what you want them to know about you and your blog. It should also invite them to subscribe to your blog. This is a no-brainer, yet so overlooked in many About Pages. He also gives other wonderful ideas, but I’ll let you buy the book to check out those. You may also view Michael’s About Page for reference here. While in Miami, FL at my spiritual father’s conference, his good friend, Dr. Renny McLean spoke these words: have faith in your voice. Now, if you’re reading my blog, tempted to purchase Platform, or have some other type of business, book, ministry, or invention, you must prepare yourself to speak that which God has given you to the world. Proverbs 18:16 tells us that a man (or woman’s) gift makes room for them and brings them before great men. This is the essence of Platform and preparing yourself to speak to these “great men” will not only expand your Platform, it will expand your wallet! It will also place you in a position of authority that others will position themselves to learn and glean from. Isn’t that the point of everything we’re doing? Preacher or curator, author or inventor, it is our job to do our part to get the word out and God will do the rest through divine appointments, connections, and more. Building a Speaking Page will encourage those who didn’t consider your speaking abilities to explore them and invite you. Others will be happy to find if because they were expecting this “product” from you all along. Do you really want to disappoint them? As my new eBook Godly Government releases (more info to come soon!) on Election Day 2012, it is my opportunity to start building, not only a writing, but speaking Platform for myself. Creating a Speaking Page on my blogs will help push me mentally, emotionally, and logically in that direction. Please see Michael’s Speaking Page here. 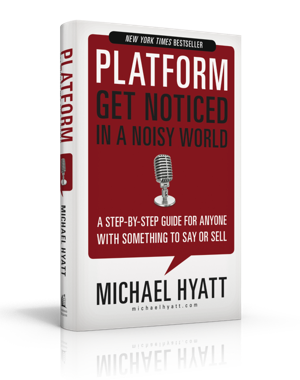 Tune in next week for more wisdom from Platform and until then, PLEASE be sure to visit Michael Hyatt’s site and buy your very own copy of Platform! This week we’re discussing Michael Hyatt’s new book Platform and some pointers that stood out to me as a soon-to-be-published author, blogger, columnist, and entrepreneur. I know that if his book helped me, it will help you as well and I want to shout it from the rooftops that Platform is what I consider the “social media networking and marketing bible!” If you don’t have your own copy, PLEASE get it today! Today we’re discussing Part II of Platform which is entitled “Prepare to Launch.” We already discussed “Part I: Start with Wow” and will now focus on getting that “wow” ready for the world to see. Create an Elevator What?! An Elevator Pitch. Before picking up Platform, I had never heard the term “elevator pitch.” An elevator pitch is a “short summary of your product offering, including your target market (the people most likely to become your customers) and your value proposition (what you have to offer those customers).” This consists of 4 integral components—which I will not list here (buy the book! ), but I will show you what mine looks like and you can glean from there. 1) I have written a new book called The Final Hour: [Understanding the Mandates and Position of the Church]. 2) It is written for anyone in church and government leadership as well as anyone with a call to ministry on any level. 3) I teach my readers three things: the mandates and mantels upon the Church, the strongmen and strongholds against the Church, and the glory of God in the last hour of the Church. 4) I thoroughly breakdown how each point operates as well as how it applies to each and every one of us. Elevator pitches are meant to be memorized—organically, not robotically—so when you do find yourself on an “elevator,” escalator, plane, etc., you’ll be able to “pitch” your product. It’s brilliant really. I thought this pointer was nifty as well. To my knowledge, I am not currently able to employ this on my blogsite, but once I get a stationary website, this is definitely something I’ll consider adding. Just like in a book, a Table of Contents helps one to “navigate” where they want to go, whether it’s reading in order or going straight to that section that stands out to them. It is the same on a website accept instead of telling you where to navigate, it does the navigating for you! You can see Michael’s Table of Contents on his Speaking Page. I thought this was so nifty because sometimes interviewers may not exactly know what makes you, your product/ministry/organization/company/etc. special in the world. So this is where you help them out by steering them in the right direction. It comes to mind that this could help to steer away individuals who may not want relevant interviews done with you (i.e. “messy” interviewers—people who want dirt on you, people who are in irrelevant fields to yours and your interests, etc.). Some of you may refer to this as your testimonials, reviews, etc., but the concept is the same. Dedicate a place on your website to the “raving reviews” of your clients, customers, patrons, etc. It works just like it does when you’re shopping online. The likelihood that you buy into a brand or product that has great reviews is much better than the same that has either no reviews or, worse, bad reviews! Employ these reviews to serve as references for you and your brand. Can’t go wrong with word-of-mouth-marketing! Welp, I hope this helps you. Next week, we’ll go onto Platform: Part III. And please, please, please buy your very own copy of Platform! Some of you may or may not know that I follow Michael Hyatt, former CEO and current Chairman of Thomas Nelson, on his blog. (I highly recommend that you subscribe to it as well.) But what you may not know is that he is the author of the new, highly acclaimed book Platform: Get Noticed in a Noisy World. I’ve read this phenomenal book and consider it the “social media networking and marketing bible.” Yep. It’s just that wonderful. Platform is divided into five sections and thanks to my pc crashing, I was able to read it—and take mad notes, doing several bits of “upgrading homework”—in 6 days. Basically, I took a section a day and let it all sink in. I recommend you do the same or if you busier than I was while reading it—which most of you are—you can read one or two of the bite-sized chapters a day. Each chapter is the length of a blog post which makes for great, quick reading. I’ll be devoting my next five posts to Platform and what I gleaned most from it. I hope it helps you and encourages you in your own endeavors. • The Ins and Outs of the WOW Factor. Chapters 2: “Bake in the Wow” and 3: “Exceed Market Expectations” focus greatly on the “wow experience” and overall, outdoing yourself in the process of presenting your “compelling product” (see Chapter 1: “Create a Compelling Product”) to the world. The “wow factor” should be a given, yet for many it is not. In Chapter 2, Michael illustrates a meeting with his team wherein he asked them all to think of a wow factor in their own lives—the birth of a child, an adrenaline rush, travelling abroad, etc.—and to brainstorm a list of what each experience had in common. The purpose of the list was to create a list of wow factor pointers that could be translated to the marketing and presentation of your product whether it be a new book or innovative creation. Whatever you offer—even if it’s yourself (your personal brand)—you should always have a wow factor. • Hold Out for the Wow. As the former CEO of Thomas Nelson with years upon years of experience in publishing, Michael Hyatt is no stranger to various mindsets and events that cause one to come up with a non-wow-factor-product. Time constraints, family emergencies, unforeseen circumstances/factors, etc. Michael is no stranger to any of them. Yet at the end of the day he recognizes that whatever excuse we have, it’s not good enough to present a product that simply isn’t ready. Don’t move on to the next project. Don’t comfort yourself with excuses. Work until you reach perfection. Nothing else is acceptable. • What’s in a Name? EVERYTHING. Shakespeare posed this question before anyone else. Well whether or not a rose named a “skunk thistle” would smell as sweet, most of us wouldn’t bother to find out. Why? Because we are innately prejudiced as human beings. If something sounds nice, we presume that it is nice. Similarly, if something sounds bad or tacky or cheap, then we presume that it is. Hence the importance of a name. Whether it’s a book, business, or Bar-B-Que recipe, it must sound enticing to the people you want it to entice. If the name of my new book (#thefinalhour, *crossing fingers* soon to be published) doesn’t cause my target demographic/audience to run out and buy it and tell their friends about it, then the name is a failure. “Give your product a memorable name.” (See Chapter 6.) Otherwise, no one will bother to find out what it is. Platform is AMAZING. I’ve recommended it several times over to friends and social media followers. I hope you all will run out and buy it today either in stores or online. What do you all think about Platform: Part I? Are these pointers you can agree with and relate to? Let me know!